"Public reason requires that the moral or political rules that regulate our common life be, in some sense, justifiable or acceptable to all those persons over whom the rules purport to have authority. It is an idea with roots in the work of Hobbes, Kant, and Rousseau, and has become increasingly influential in contemporary moral and political philosophy as a result of its development in the work of John Rawls, Jürgen Habermas, and Gerald Gaus, among others. Proponents of public reason often present the idea as an implication of a particular conception of persons as free and equal. Each of us is free in the sense of not being naturally subject to any other person's moral or political authority, and we are equally situated with respect to this freedom from the natural authority of others. How, then, can some moral or political rules be rightly imposed on all of us, particularly if we assume deep and permanent disagreement amongst persons about matters of value, morality, religion, and the good life? The answer, for proponents of public reason, is that such rules can rightly be imposed on persons when the rules can be justified by appeal to ideas or arguments that those persons, at some level of idealization, endorse or accept." Jonathan Quong is Senior Lecturer in Political Philosophy at the University of Manchester. He is the author of "Liberalism Without Perfection" (Oxford University Press, 2011). See my post on his book here. Dworkin on "A New Philosophy for International Law"
"As he grew older and the thought of death obsessed him more, Derrida seemed eager to come to a rapprochement with some of his former adversaries. In October 1999, in New York, he again met Jürgen Habermas at the home of their common friend Giovanna Barradori. At this unexpected encounter, Habermas had the ‘smiling kindness’ to propose that he and Derrida hold a discussion. Derrida accepted immediately: ‘It’s high time,’ he said, ‘let’s not wait until it’s too late.’ The meeting took place in Paris shortly afterwards. During a friendly lunch, Habermas did all in his power to ‘wipe out the traces of the previous polemic, with an exemplary probity’ for which Derrida would always be grateful. The two men had not been on good terms for over twelve years, because of the two ‘unfair and hasty’ chapters that Habermas had written on Derrida in The Philosophical Discourse of Modernity and Derrida’s stinging response in Mémoires: For Paul de Man and Limited Inc. [......] For Derrida, the quarrel with Habermas had had serious consequences: since the mid-1980s, access to the most important German publishers had been blocked, and his influence in the German-speaking world had been greatly hampered. In 2000, Habermas and Derrida organized a seminar together in Frankfurt on problems in the philosophy of law, ethics, and politics. Alexander García Düttmann remembers the disquiet that this ‘reconciliation’ spread among the disciples of the two philosophers. ‘This rapprochement irritated me. Philosophically, they had nothing to say to one another. But politically, okay, they agreed on several points. Also, we shouldn’t underestimate tactical considerations. Derrida could be very trenchant, but he could also be a skilled negotiator when the occasion called for it. Depending on the context, he could be radical or almost consensual, courageous or calculating.’ Avital Ronell confirms that this episode caused their respective associates some heart-searching: ‘One could write an entire history of great men or women [. . .] and their disciples, a history of associations or dissociations, of gravitational pull. [. . .] Small groups quarrel and suddenly their leader, Mafi alike, perhaps, proposes a truce.’ One thing is certain: making up with Habermas meant that Derrida quickly reassumed a position in Germany that he had lost. Several plans for translation and re-publication saw the light. But other factors also helped to thaw the situation. After many years spent in the United States, Werner Hamacher, a follower of Derrida, had returned to teach in Frankfurt in 1998; he soon invited Derrida there, to give the lecture ‘The university without condition’. On this occasion, Derrida met up with Bernd Stiegler – not to be confused with Bernard Stiegler –, who had attended his seminar in Paris a few years earlier and now had an important position with the great publisher Suhrkamp. The Adorno Prize would soon seal Derrida’s reconciliation with Germany." ["Derrida", p. 501f]. In 2003 Jürgen Habermas and Jacques Derrida published together "A Plea for a Common Foreign Policy, Beginning in the Core of Europe". Lincoln Dahlberg is Visiting Fellow at the Center for Critical and Cultural Studies, The University of Queensland. The debate between Jürgen Habermas and John Rawls "concerns their respective political theories. It is basically a dispute between Rawls’s theory of Political Liberalism, and Habermas’s Discourse Theory of Law. It is not primarily a dispute between Rawls’s A Theory of Justice, and Habermas Discourse Ethics. Principle (U) is the central idea in Habermas’s Discourse Ethics, which is a moral theory, not a theory of law or of democratic legitimacy, while the argument from the Original Position takes a back seat in Rawls’s Political Liberalism. People who interpret the Habermas Rawls dispute in the light of the contrast between Habermas’s principle (U) and Rawls’s Original Position, are looking at the wrong thing and so miss the real points of dispute. What people should have been asking is this. What are the central organizing ideas of their respective political theories, and on what significant points do these ideas conflict? To my mind the real point of dispute concerns their different conception of the political and of democratic legitimacy. According to Rawls “ the liberal principle of legitimacy” implies that legitimate laws, laws whose enforcement is properly justified to those who must live under them, may not appeal to principles and ideas insofar as they form part of any comprehensive philosophical or moral doctrine, but only insofar as they form part of an overlapping consensus of all reasonable comprehensive doctrines. For various reasons, Habermas has to deny this. For one thing, he maintains that morality, that is principle (U) and the norms it validates, constrain what can count as legitimate law. Habermas claims at various places that that legitimate laws must “harmonize with the universal principles of justice and solidarity”. More precisely he writes that “a legal order can be legitimate only if it does not contradict basic moral principles.” Whatever way you look at it Habermas’s conception of morality (and his theory of Discourse Ethics) is what Rawls would call comprehensive moral (or philosophical) doctrines. The fact that Habermas calls his theory ‘proceduralist’ is irrelevant. After all he claims that substantive moral norms, namely all those norms that are validated by the procedure – namely discourse in conformity to (U) – constrain legitimate laws on pain of giving rise to cognitive dissonance (between moral and legal demands). There are other important differences too. Habermas allows that conceptions of the good may be germane to the justification of legitimate law, a claim that Rawls again, must deny. Finally, Rawls is right to claim that Habermas’s conception of legitimacy is comprehensive, at least in one obvious sense: it presupposes that a controversial philosophical theory is true, namely discourse ethics." James Gondon Finlayson is Senior Lecturer in Philosophy at the University of Sussex. He is the authour of "A Very Short Introduction to Habermas" (Oxford University Press, 2005) and co-editor (with Fabian Freyenhagen) of "Habermas and Rawls. Disputing the Political" (Routledge, 2011). Was is gerecht? Was ist gut? Dieses Buch bietet eine breit angelegte Analyse von Gerechtigkeit und ihrem Verhältnis zum Guten. Anders als weithin üblich werden allgemeine Gerechtigkeit und Verteilungsgerechtigkeit in einem Zuge bearbeitet. Der Schwerpunkt liegt dabei auf deliberativen Theorien der Gerechtigkeit. Diesen zufolge erlangen Gerechtigkeitsaussagen Gültigkeit durch Prozesse des Überlegens, die in der richtigen Weise mit den Überlegungen derjenigen, für die sie Orientierung sollen bieten können, verbunden sind. Diese allgemeine Charakterisierung der Grundidee deliberativer Gerechtigkeit zu einer Theorie auszubuchstabieren, erfordert eine Vielzahl von speziellen Bestimmungen bezüglich dessen, was Gerechtigkeits-aussagen sind, wie und wen sie orientieren können sollen, sowie: was Überlegungen sind und wie sie beschaffen sein müssen, um zu gültigen Aussagen zu kommen. Die Autorin setzt sich insbesondere mit den Theorien von John Rawls, Thomas Scanlon und Jürgen Habermas auseinander. Eine konsequent deliberative Theorie ist, so Nadia Mazouz, erst mit einer deliberativen Theorie der Gerechtigkeit und des Guten erreicht. Eine halbierte deliberative Theorie, wie sie von den kritisierten Autoren vertreten wird, ist mit charakteristischen Setzungen behaftet, die den deliberativen Kern gefährden. Daher schlägt Mazouz vor, den Bezug des Gerechten zum Guten in einem vierten Modell – dem Perspektivenmodell – zu beschreiben. In diesem sind das Gerechte und das Gute Perspektiven auf das zu Beurteilende, wobei typischerweise Handlungen oder Institutionen beurteilt werden: Gerechtigkeit und das gute Leben sind nicht Bereiche mit unterschiedlichen Gegenständen, sie sind Weisen, Überlegungen zu beurteilen: als Überlegungen, in denen die Überlegungen anderer eine bestimmte Rolle spielen oder auch nicht, es sind Perspektiven, aus denen heraus Überlegungen beurteilt werden. Nadia Mazouz ist wissenschaftliche Assistentin am Lehrstuhl für Praktische Philosophie von Lutz Wingert an der ETH Zürich. 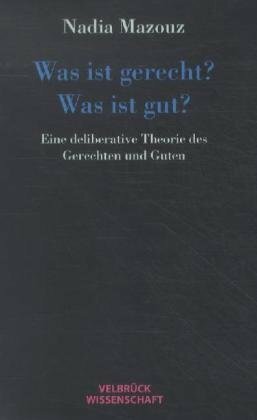 Dissertation: "Aspekte einer deliberativen Theorie des Guten und Gerechten" (2009) [pdf]. "How to Understand Rawls’s Law of Peoples"
"Through the Eyes of Habermas: The Heritage of Liberalism and Deliberative Politics"
The issue can be downloaded here. Part I. What are Human Rights? Part II. 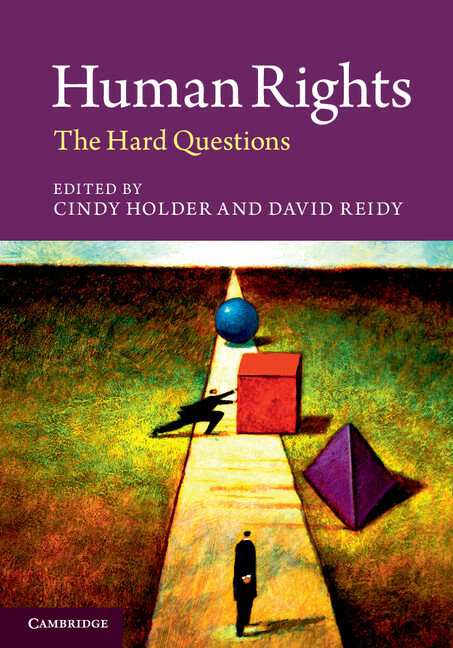 How do Human Rights Relate to Group Rights and Culture? Part III. What do Human Rights Require of the Global Economy? Part IV. How do Human Rights Relate to Environmental Policy? Part V. Is There a Human Right to Democracy? Part VI. What are the Limits of Rights Enforcement? Cindy Holder is Associate Professor of Philosophy at the University of Victoria, British Columbia. David Reidy is Professor of Philosophy at the University of Tennessee, Knoxville, Tennessee. William Outhwaite reviews Ulrich Beck's "German Europe"
William Outhwaite finds Beck’s book to be rich in ideas, but questions whether the responsibility for austerity policies should be specifically ascribed to Germany. See also my post on Ulrich Beck's discussion with Daniel Cohn-Bendit and Mary Kaldor at the LSE on March 21: "German Europe: Are there Alternatives?" (video podcast). "Political Liberalism, Religious Liberty, and Religious Establishment"
[Forthcoming in Hanoch Dagan, Shahar Lifshitz, & Yedidia Z. Stern (eds.) - "The Role of Religion in Human Rights Discourse"]. What stance toward religion does a just state maintain? This essay outlines and defends an answer to this question that is associated with the slogan calling for the separation of church and state. The defense consists of knocking down bad defenses and merely gesturing toward a better one. But even if this hint of a defense can be successfully developed, it will only go so far. Toward the end of the essay, an objection is raised that is not susceptible to decisive refutation and that can be properly engaged only by case by case adjudication seeking best policies for current actual circumstances. The issue in play here arises from the consideration that, despite the fact that it would be morally desirable to achieve a certain goal, it does not follow that any attempted movement toward achieving that goal would be morally desirable in any and all circumstances. Richard Arneson is Professor of Philosophy at the University of California, San Diego. "Blätter für deutsche und internationale Politik" (May 2013) features an extensive review by Jürgen Habermas of Wolfgang Streeck's latest book "Gekaufte Zeit" (Suhrkamp Verlag, 2013). The review is titled "Demokratie oder Kapitalismus. Vom Elend der nationalstaatlichen Fragmentierung in einer kapitalistisch integrierten Weltgesellschaft" (Blätter, pp. 59-70). "In seinem Buch über die vertagte Krise des demokratischen Kapitalismus entwickelt Wolfgang Streeck eine schonungslose Analyse der Entstehungs-geschichte der gegenwärtigen, auf die Realwirtschaft durchschlagenden Banken- und Schuldenkrise. [.....] Den Ausgangspunkt bildet die berechtigte Kritik an der von Claus Offe und mir Anfang der 70er Jahre entwickelten Krisentheorie. Der damals vorherrschende keynesianische Steuerungs-optimismus hatte uns zu der Annahme inspiriert, dass sich die politisch beherrschten wirtschaftlichen Krisenpotentiale in widersprüchliche Imperative an einen überforderten Staatsapparat und in "kulturelle Widersprüche des Kapitalismus" (wie es Daniel Bell einige Jahre später formulierte) verschieben und in der Gestalt einer Legitimationskrise äußern würden. Heute begegnen wir (noch ?) keiner Legitimations-, aber einer handfesten Wirtschaftskrise." [......] Wolfgang Streeck teilt die Annahme, dass sich die egalitäre Substanz der rechtsstaatlichen Demokratie nur auf der Grundlage nationaler Zusammen-gehörigkeit und daher in den territorialen Grenzen eines Nationalstaates verwirklichen lässt, weil sonst die Majorisierung von Minderheitskulturen unvermeidlich sei. Ganz abgesehen von der umfangreichen Diskussion über kulturelle Rechte, ist diese Annahme, wenn man sie aus der Langzeit-perspektive betrachtet, willkürlich. Bereits Nationalstaaten stützen sich auf die höchst artifizielle Gestalt einer Solidarität unter Fremden, die durch den rechtlich konstruierten Staatsbürgerstatus erzeugt wird. Auch in ethnisch und sprachlich homogenen Gesellschaften ist das Nationalbewusstsein nichts Naturwüchsiges, sondern ein administrativ gefördertes Produkt von Geschichts-schreibung, Presse, allgemeiner Wehrpflicht usw. An dem Nationalbewusstsein heterogener Einwanderungsgesellschaften zeigt sich exemplarisch, dass jede Population die Rolle einer „Staatsnation“ übernehmen kann, die vor dem Hintergrund einer geteilten politischen Kultur zu einer gemeinsamen politischen Willensbildung fähig ist." See a preview of Wolfgang Streeck's book here.